For parents out there who love their children, who would do just about anything to secure their child’s safety and freedom, what would you do if your twenty-one year old son ended up in a foreign prison of a totalitarian state for a first-time offense that he committed in a moment of youthful indiscretion? And even more heart-rending: a twelve-year prison sentence that should, by all rights, have been only a two-year penalty to fit the crime. Fill in the blanks with your answer(s) to such a tough question … such a difficult dilemma. Whatever your reaction, it’s likely that such emotions as embarrassment, sadness, disbelief, anxiety, and probably anguish would flood your mind and heart. But what if, by what many might call a stroke of luck, government bureaucrats of that dictatorial country relented and reduced the sentence to five years? Then … what if, by what others would consider to be the grace of God, court officials in an act of unprecedented mercy commuted your son’s sentence by deporting him back to the United States, back to family and friends … back to you?! Of course you would be thrilled and grateful for such an astonishing turn of events. But after all the preparations had been made for your son’s return home, what would be your response if you received a call from your son telling you that he preferred to remain in prison for the full twelve years? Because he didn’t think that his punishment (or the punishment for any crime) should be pardoned or forgiven. That he didn’t believe in mercy of any kind, particularly a gracious amnesty that would give him a second chance for a brand new start to life. Now, take this illustration to another (lower) level: What if your son told you that after serving his full sentence, he intended to remain in this autocratic state that demanded complete capitulation, absolute adherence, and submissive surrender to its laws and leaders for the rest of his life? He wanted no part of the democratic freedom so cherished in the United States of America. That he preferred the idea of rule by force, of might makes right, of survival of the fittest and strongest. In short, rejection of the precept that every person has the God-given inalienable privilege to pursue life, liberty, and happiness. Moreover, if he ever felt like reclaiming his freedom in America, he would first need to earn that right of return by serving under this system of despotically overbearing regulations; heavy-handed even to those who managed to obey most of these suppressive laws in an oppressive country full of mindless, robot-like submission to domineering leaders who demanded perfect performance (obedience) from their subjects. That’s exactly the Apostle Paul’s reaction to what had happened in some of the churches in Galatia. Especially the Jewish believers who, for all practical purpose, wanted to give back their heavenly citizenship rights, to give up their incredible freedom purchased with the life-blood of Jesus. Some had returned to the Law of Moses as a means to salvation; thereby, becoming imprisoned once again to the enslaving notion that human effort (good works) was the only way to merit a right relationship with God. Paul’s greeting to the churches in Galatia begins with a solemn but joyful reminder of what Jesus had done for them: “Jesus gave his life for our sins, just as God our Father planned, in order to rescue us from this evil world in which we live. All glory to God forever and ever! Amen” (Galatians 1:4-5). Should anyone think that (if the good things they do outweigh the bad) they might be an exception to this universal Divine truth, read again the last sentence of this verse: For NO ONE will ever be made right with God by obeying the law! (Upper case letters, italics, and exclamation point for added emphasis). “For Christ himself has brought peace to us. He united Jews and Gentiles into one people when, in his own body on the cross, he broke down the wall of hostility that separated us. He did this by ending the system of law with its commandments and regulations….” (Ephesians 2:14-15, italics for emphasis). Today, just as in Paul’s time, we see legalistic efforts to bend, shape, and contort the Grace of God into a massive maze of rulings and regulations and rituals that (1) cleverly contradict and deviously distort the very means of salvation; or (2) change the Holy Spirit led dynamics of living the Christian life with an inordinate impossible demand of keeping the Old Covenant as a means of staying saved or meriting God’s favor (Grace) for daily life and (hopeful) entrance to heaven at the time of death. Religious requirements come in packages of all shapes and sizes. Including, but not limited to, organizational church-imposed and/or church-expected meritorious works through self-effort such as: Infant and adult baptism, church membership, mandatory tithes, completion of non-Biblical catechism curriculum, periodic sacrament observance, compulsory recital of prayers or excerpts from religious books, obligatory giving to the poor, forced observance of special holy days, requisite penance for transgressions, necessary hostility to those who believe differently (infidels), rote performance of required rituals, prescribed practice of non-Biblical church traditions, involuntary abstinence from certain foods and drinks, confirmed celibacy, and perfunctory performance of “righteous” deeds—most of which are dutifully defined by the ecclesiastical hierarchy of that religion that end up being nothing more than self-righteous exploits. 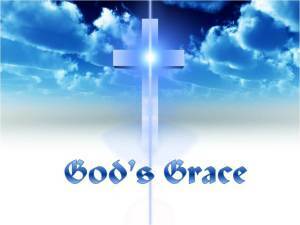 Over and over the apostle Paul tells us that the Grace of God not only saves us, but keeps us saved. That trying to keep the law to get saved or stay saved is not only impossible, but an affront to God. Oftentimes well-meaning Christians as well as not so well-meaning cults that are Christian in name only will twist and turn the words of Jesus to try to persuade their listeners that the Law of Moses, including the clerical priesthood, was never removed. Therefore, they contend that it is incumbent upon all who want to obtain and maintain a right standing with God and with their church to comply with the Law and regulatory church traditions in order to enter and remain in a “state of Grace.” Which means among other things that any unconfessed violations of the Law prior to one’s death could very well prevent that person from going to heaven. For example, that’s why Catholic priests administer last rites. What exactly did Jesus mean when he said: “Do not think that I came to abolish the Law or the Prophets; I did not come to abolish but to fulfill” (Matthew 5:17, NASB). The Greek word for fulfill is pleroo (pronounced play-ro’-o) which means: to complete, to consummate, to carry into effect, to accomplish the purpose of (the Law). How does this profound statement of truth from Christ match up with the above quoted passage from Ephesians Chapter 2, in which Paul, in no uncertain terms declares that Christ ended the system of law with its commandments and regulations? Who’s right; Jesus or Paul? Of course that’s a senseless question because they’re both right, even though they’re saying what appears to be (at face value) opposite things. There are many verses in Scripture that are completely stand-alone verses, such as John 3:16. However, there are other passages that must be compared, Scripture with Scripture (the whole counsel of God), and not quoted independently as a means to defend a viewpoint or position that is wrong to begin with because of the very fact that the verse is used out of context or because it (if not adequately clarified and understood) might seemingly contradict another passage. The Bible never negates itself; so if there are two or more passages which seem to do just that, then they must be carefully analyzed, compared, and explained together as a whole. All cults are based on a handful of verses that, when not correlated to other Scripture, will distort the main tenets of the Bible (especially salvation) and create a whole new religion, which Paul calls a false gospel. Without a properly balanced examination of the seemingly paradoxical fact that Jesus fulfilled the Law of Moses only to end the Law, three theological/spiritual errors will (many times have) result. The misguided notion that God’s Grace—without an equal emphasis on and keeping of the Mosaic Law—is not enough to be born again (saved, redeemed). The idea that we must continually keep the law to gain God’s favor after salvation. That continuous good works (fulfilling the law) is necessary to keep God’s grace intact right up to the time of death, in order that one not lose or forfeit their salvation. When Jesus said, “I came to fulfill the law,” the emphasis is on “I,” meaning Christ, himself. That it was He, and only He who could have fulfilled the law; which totally qualifies him as the only one who could make the once and for all sacrifice for our sins. He didn’t say or mean that he accomplished all points of the law in order that we, too, must strive to fulfill it. Just the opposite: He fulfilled it because we couldn’t. Christ said this to reinforce the fact that no human being could ever successfully keep the law either as a means of salvation or as a means to preserve that salvation. Once he achieved perfection with the law, there is no need for any of us to try or to keep trying to fulfill it ourselves, because we can’t … never could and never will. “For everyone has sinned; we all fall short of God’s glorious standard” (Romans 3:23). Paul further reinforces what Jesus said and did: “For Christ has already accomplished the purpose for which the law was given. As a result, all who believe in him are made right with God” (Romans 4:4). A commentary on that verse would be: Christ did all the work … now all we have to do is believe in him and what he did (before, during, and after the Cross). In other words, Scripture tells us to stop focusing on (impossible or at least inconsistent) obedience to the law and focus on Jesus alone. Obedience will then come more naturally (actually supernaturally). For further clarification, notice that I, based on Scripture, didn’t say that we have no obligation to obey God’s moral and spiritual laws; rather the emphasis is how and why we obey the law. And it’s certainly not to earn salvation or merit God’s grace. Keep reading for more amplification. What Christ is saying is that the law itself will never be abolished. “Thou shalt not commit adultery,” and the other commandments will always be God’s principled standard of conduct, but which no one can or ever will keep. (Break one law and you break them all is what Scripture clearly teaches). Of course the Ten Commandments are still a moral compass that is every bit as applicable today as it was when the law was given. But what about the hundreds of years before the law was given, going at least back to the time of Abraham? How were those folks made right with God, when there was no law? (See Romans Chapter 4 for the answer to that question). According to Jesus and Paul, one of the most grievous most damaging sins were those of the Pharisees, whom Jesus called sons of the devil, sons of hell, hypocrites; and certain Jews (both believers and unbelievers) who Paul accused of combining Law with Grace, Why? Because not only did they consider themselves righteous by virtue of keeping the law, but they were making others “sons of hell” by telling them that the only way to gain God’s favor and forgiveness was by keeping the law of Moses. That’s why they crucified Christ, because he said he was the Messiah; because he told them that He was the only Way, Truth, and Life and that no one could come to the Father except through him. That’s why they rejected him; because to them the Mosaic Law was the only way to God. How dare someone say differently! Jesus warned the Jewish leaders, “Moses, himself, will condemn you” (John 5:45). That statement is utterly astonishing! How or why would Moses condemn anyone for keeping the law? Answer: Because they placed the law above the only way of true righteousness—faith in Christ (and before Jesus came, faith in the promise of his coming). That is why the only people that Jesus ever truly censured were the (self) righteous religious teachers of the law. On the contrary, those who acknowledged their inherent sin nature and the iniquities this sin nature innately (naturally) produced, those who reached out to Jesus for physical and spiritual healing; experienced salvation through and from a Savior who loved them and who longed to save them from their sins … from eternal judgment apart from God. What IS abolished is the keeping of the law or fulfillment of the law in order to be saved and to stay saved. In fact, that never existed in the first place … meaning salvation through the law. But neither is trying to live the Christian life ever successful or even recognized by the Lord through the self-effort of “fulfilling the law.” That’s why Paul told the believers in Galatia that they were “foolish.” (Galatians 3:1). He went on to challenge them, “Let me ask you this one question: Did you receive the Holy Spirit by obeying the Law of Moses? Of course not! You received the Spirit because you believed the message you heard about Christ. How foolish can you be? …why are you now trying to become perfect by your own human effort?” (Verses 2-3). Paul continues: “Why, then was the law given? It was given alongside the promise to show people their sins. But the law was designed to last only until the coming of the child who was promised….” (Galatians 3:19). The progenitor promised child was Abraham’s son, Isaac (not Ishmael); with Jesus Christ as the ultimate Child of Promise (to the whole world). Therefore, Scripture is crystal clear that the law was temporary. It’s only purpose was to show just what sinners we are, so that we would stop trying to keep the law as a means of salvation or even as a means of trying to please God and keep in good standing with him after we’re saved. Our good works are a RESULT of the free gift of salvation (God’s Grace). Not a requirement or the means of salvation. Our right standing with God is based on a RELATIONSHIP with him through his Son, Messiah Jesus. Not through any religion. We can try all we want to satisfy the law or any rules and regulations that we impose on ourselves and others, and it will do us absolutely no good, whatsoever. In fact it only leads to total frustration and failure. Both secular humanism and clergy and laity alike in religious systems such as Mormonism, Catholicism, Jehovah Witnesses, Islam, Buddhism, Hinduism, but even some born-again Christians are constantly and in futility trying to: Work their way into or back into God’s favor. Frankly, that’s an insult to God because it contradicts and replaces the only means of a right relationship with God … Jesus Christ. In fact, Paul tells us that when we make the law our main focus and falsely believe that keeping it will keep us in good standing with God, we are “crucifying Christ” all over again. There’s more. Paul perceptively states: “But suppose we seek to be made right with God through faith in Christ and then we are found guilty because we have abandoned the law (Paul is referring to anyone who would say we were “guilty” if we discard the law). Would that mean that Christ has led us into sin? Absolutely not! Rather, I am a sinner if I rebuild the old system of law I already tore down. For when I tried to keep the law, it condemned me. So I died to the law—I stopped trying to meet all its requirements—so that I might live for God. My old self has been crucified with Christ. It is no longer I who live, but Christ lives in me. So I live in this earthly body by trusting in the Son of God, who loved me and gave himself for me. I do not treat the grace of God as meaningless. For if keeping the law could make us right with God, then there was no need for Christ to die” (Galatians 2:17-21, italics for emphasis). Those who have a legalistic mindset, including some Christians, are those who live by a list of do(s) and don’t(s), including the law and other things they think must be followed. They (erroneously) believe that God’s favor is earned by good behavior. Conversely, true Christianity is expressed by those who love the Lord and live in gratitude for his free gift of grace and eternal life. By relying on the Holy Spirit who enables us, “…to do what is right, to love mercy, and to walk humbly with your God” (Micah 6:8). To constantly tell or remind others that Christ came to fulfill the law but not to abolish it, without clarifying what that means or without explaining that both salvation and the Christian life, itself, is through grace and grace alone, is to confuse and mislead them. Cults do that all the time. They add to or subtract from the Bible. Or they take one or two verses and make an entire doctrine out of them, without comparing the passage with the whole counsel of Scripture. It’s a deadly spiritual recipe … a mixture of Law and Grace. If anyone was told that they would be granted a full pardon for their crimes (sins) against God, why would they want to stay in or return to the prison (of their sins)? Why would they throw away the key of Grace that opened the prison door of sin to set them free? How could they step back into a prison cell of a legalistic penal system that requires flawless performance and picture-perfect behavior in order to be released from a jail with four walls and a ceiling covered with do(s) and don’t(s) that no one could ever keep no matter how hard they try? Stay tuned next week as we look at the third and final article on the Age of Grace.